CELT’s Officers, Directors, and Advisory Council are your friends and neighbors. They contribute generously of both their time and resources. Any of them will be glad to tell you how you can help too, and contribute to preserving the special character of Cape Elizabeth. Wyman Briggs grew up spending summers fishing and boating off the island of Islesboro in Penobscot Bay and canoeing the rivers of northern Maine as a whitewater touring guide. After earning degrees from Middlebury College, the London School of Economics, and Harvard University (Environmental Policy), he completed 22 years as a Coast Guard officer in the field of marine environmental response. After serving a year as the Strategic Projects Manager for the Gulf of Maine Research Institute, he currently works as a civilian contingency planner and incident manager for the Coast Guard. He recently served as Chair of the Cape Nordic Board and the Town’s Alternative Energy Committee. Wyman enjoys joining his wife, Laura, and three daughters on kayaking and ski trips and occasional fly-fishing and bike touring adventures. David Briman grew up in New Jersey playing hide and seek in cornfields. He attended Rutgers College and received a law degree from New York Law School. David, his wife Katie and their three daughters moved to Cape Elizabeth from New York City in the summer of 2015. Prior to trading in city life in the West Village for the glorious Maine coast, David practiced law specializing in transactional and litigation real estate matters for 27 years, 14 of which were at his own firm. David is thrilled to be a part of the dynamic CELT community and happily joined the Board in 2018. In addition to walking in Robinson Woods with his family, David enjoys alpine and nordic skiing, hiking, biking, kayaking and gardening. Jim Fisher is founder and president of Northeast Civil Solutions, an engineering and land surveying company in Scarborough that works on projects throughout New England. With a BA from Ripon College and an MA from Monmouth University, he served for 12 years as an active duty military officer and lived in Europe for six years before moving to Maine to start his business. Jim is a certified wetlands delineator through the Army Corps of Engineers and is active in land preservation throughout the state. An active outdoorsman, he worked for a time as a canoeing and hiking guide on the Allagash Wilderness Waterway, and was active in the Scouting program for over 30 years. He is often found walking, running, and skiing along the numerous CELT trails throughout Cape Elizabeth. He and his wife Debbie have three children and have lived in Cape for over 20 years. Lisa Silverman Gent graduated from the University Of Wisconsin with a degree in Education and a minor in Environmental Studies. She has taught for many years, from young children to adults, both in the public and private sector and as an environmental education consultant. Lisa spent several years at Maine Audubon Society as the manager of the Environmental Center in Falmouth. During this time she served for 6 years on the board of directors of the Maine Environmental Education Association, serving as president for 2 years. Currently, Lisa finds time for her jewelry business as well as being a volunteer with CELT. Lisa, her husband Steve and their three boys and have lived in Cape Elizabeth since 1990. Elizabeth Goodspeed grew up south of the border in New Hampshire, but she comes from a long line of Mainers. She was thrilled to have the opportunity to move back to New England in 2013, after more than a decade in Baltimore, Maryland. Elizabeth received her BA and MHS from Johns Hopkins University and Johns Hopkins Bloomberg School of Public Health. Her professional experience is in healthcare and higher education strategic planning and management. In addition to volunteering at CELT, she is membership chair for the Cumberland County Beekeepers Association, serves on the Cape Elizabeth Comprehensive Plan Committee, and enjoys caring for her backyard menagerie, consisting of chickens, goats, and beehives. The home she shares with her husband, Aaron Parnes, and their retired greyhound, Alice, abuts Robinson Woods, which she is grateful to be able to enjoy year-round. William (Bill) Luneberg is a retired lawyer and law professor. He has summered in Maine since 1946 on Cliff Island and retired to Cape Elizabeth in 2014. After graduating from law school, he worked with the United States Environmental Protection Agency in Boston and Chicago for 3 years. Thereafter, he was in private practice in Chicago for three years before going into law teaching, first at the University of Chicago as a Bigelow Fellow, and then (for 36 years) at the University of Pittsburgh. His teaching and research specialties included civil procedure, administrative law, legislation, federal lobbying law, and environmental law. He has represented a variety of environmental organizations over the years with regard to air pollution, water pollution, and forest preservation issues. He is married with two children (and one grandson). He spends his spare time hiking, boating, and trying to improve his photography. Suzanne McGinn has an Economics degree from Boston College and worked for six years in product management, strategic planning and finance for Bank of Boston. She moved to Cape in the summer of 2003 from Ann Arbor, Michigan and quickly volunteered with CELT, co-chairing the Education Committee, 2003-2012, and in 2013 to present chairs the Stewardship Committee. She is also on the Executive Committee, and continues to lead school nature programs. She is currently involved with other volunteer projects within Cape, including serving on the Fort Williams Park Committee and Judy’s Pantry. She serves as trustee for the Chewonki Foundation, NRCM grant committee and co-chairs TNC’s Director’s Circle. Suzanne and her husband, Neil, and three grown boys enjoy many outdoor activities including hiking, biking, kayaking, and skiing. Tom McInerney grew up youngest of eight children. His family’s year-round camping trips on Cape Cod or in the White Mountains of New Hampshire helped instill an early appreciation of the outdoors. Tom spent a few summers backpacking in Rocky Mountain National Park, but was converted to beauty of the Maine mountains and coast while he studied biology at Bates. After attending medical school in Ohio, Tom did his medical residency at Maine Medical Center, and then started practicing Internal Medicine in Cape Elizabeth. In addition to his clinical practice, Tom teaches residents at Maine Medical Center and volunteers at the Free Clinic in Portland. Tom is thankful to have been able to raise his children in Cape Elizabeth, where they enjoyed camping, hiking, biking, and kayaking. Now that his children are grown, he and his wife Heidi continue to enjoy the wooded trails of Cape and surfing at Pond Cove. Tom feels it is important to give back to CELT by helping to preserve and maintain this beautiful part of Maine, which his family has been fortunate to enjoy throughout the years. Janis (Jan) Molleur was raised in Eliot, Maine and graduated from the University of Connecticut with a Bachelor of Science degree in Environmental Horticulture. While she loves the outdoors and the natural flora, the lure of the financial world pulled her toward her present career at Key Private Bank in Portland. Jan is a Certified Trust and Financial Advisor and has worked at Key for over 30 years, handling trusts, estates, endowment funds and investment and retirement accounts. Jan is a current member of the Maine Estate Planning Council. While raising her two sons in Saco, she served on the Thornton Academy Professional Advisors Board. Jan also has a seat on the United Way Foundation Professional Advisory Committee among her other volunteer efforts for the United Way of Greater Portland. She moved to Cape Elizabeth in 2008 and became a Director of the Hobstone Owners Association shortly thereafter. Jan spends much of her summers at her cottage in the New Hampshire Lakes Region and loves boating, swimming and enjoying the outdoors. Liz Murley often refers to herself as a ‘recovering lawyer,’ having practiced corporate law in Boston years ago. She lived in London for many years, doing a lot of volunteer work using her legal training to help several non-profits. Moving back to the US, she and her husband Tom considered San Francisco, Austin, Texas and Portland, and kept coming back to Cape Elizabeth because of its rural feel, only minutes from the city. Her favorite walk in the woods is the Great Pond trail, which makes her “feel like I’m a million miles away, even though I’m only 15 minutes from my front door.” She is also able to work remotely for an executive search firm in Boston which specializes in academia and non-profits. Off the clock, she sings in two choirs, Portland Community Chorus and ChoralArt Masterworks, and gets out in the woods. Nick Owens grew up in Cape Elizabeth and attended Colby College. He believes that the town’s open spaces are an important part of what makes the community special and joined the CELT Board of Directors in 2016. Nick is a consultant at The NorthBridge Group, where he works with utilities on planning, operations, and strategy. He is an avid biker and loves the ocean. Nick lives near Two Lights and appreciate all that Cape has to offer. Chris Pezzullo grew up on the south shore of Long Island, spending summers on Great Bay South and the barrier beaches of Fire Island. He moved to Maine with his wife Nancy in 1989 to attend medical school. He completed a pediatric residency at Maine Medical Center in 1996, and has since worked as a clinician, administrator, and educator; from 2011-2013 he served as President of the Maine Osteopathic Association. Chris is now the Chief Health Officer at Maine DHHS and Medical Director at MaineCare, and continues to work part time as a pediatrician in Portland. He has two children, one an educator and one an organic farmer. 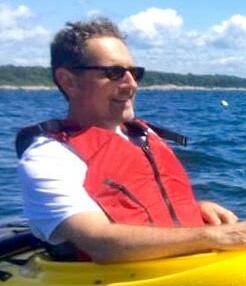 He and his wife love walking the CELT trails, and kayaking on the coves and rivers of Cape Elizabeth. He is proud to be a part of a team dedicated to maintaining the beauty and health of our coastal Maine town. Erika Carlson Rhile is the Science Department chair at Cheverus High School. Erika’s background is in marine ecology, and she spends her summers on Swan’s Island conducting field research for the University of Pennsylvania. A certified Maine Master Naturalist, Erika enjoys all things outside, but especially enjoys hiking, paddleboarding, and cruising the Maine coast with her husband and two young children. Deidre St. Louis moved to Maine in December of 2015, soon after retiring from the U.S. Forest Service. She searched for a retirement location up and down the East Coast, and chose the Portland area because of its beauty; excellent sea kayaking and bicycling opportunities; the nearby White Mountains; the friendliness of the people; and the allure of Portland. She worked for the Forest Service for over 30 years in Colorado, Arizona, New Mexico, Oregon, Alaska, and Washington DC. Most of her work was in outdoor recreation management. Chris Tullmann has recently returned (2016) to Cape Elizabeth after living away for 8 years. Chris has a degree in Civil Engineering (WPI) and has worked with land use and transportation planning. He has been working and playing in the outdoors his entire life and sharing that with family and friends. Chris brings experience to his role as chair of the Stewardship Committee from the other places he has lived and the many other land conservation and trail organizations with which he has worked. Chris and his wife Paige have two young sons, with whom they enjoy spending time outside on foot, bike, boat, or skis.